The story focus on Aravind and Priya, a middle class couple. The former runs a medical shop while the latter is an Accountant working in a local firm. Shedding light on the present educational system, "Salt Mango Tree" show the effort the two protagonists put together to get their only son admitted to some reputed English Medium school in the City. Having enough scope for taking a dig at the educational system, interview boards and the way interviews are conducted for children and parents at the time of admission, the spoofing with the humor in the backdrop do act as the entertaining portion in the film. Also our hero is not fluent in English and the scope of humor available have been utilized nicely. But the overdose of melodrama at many places makes the proceedings dull. 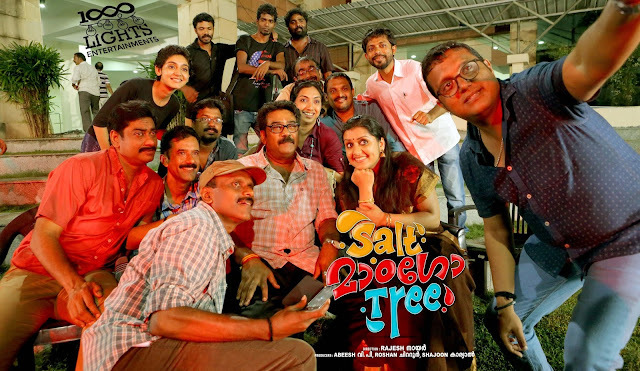 What saves the film from these negative moments are definitely the comedy part, the simpler narrative and Biju Menon's style of acting we see from him these days. The amount of effort and training that the parents of the children putting in to get their wards admitted to schools was a bit exaggerated. Rajesh Nair who couldn't taste any box office success in "Annum Innum Ennum" and "Escape from Uganda" direct "Salt Mango Tree" that unconvincingly try to pass some relevant and valuable messages. But in the process the film becomes too preachy. Though watchable primarily for the one liners and comic timing of Biju Menon, the film follow a steady path right from the start till the end. Lakshmi Priya Chandramouli whose voice is dubbed quite well makes a perfect. Sudheer Karamana, Suhasini, Saiju Kurup, Paris Laxmi, Indrans and Sunil Sugadha are also part of the cast. A special mention to Haresh for his lively comic act in that typical Kozhikodan style. Cinematography by Vishnu Sharma created a pleasing feel for the eyes. Edits were also fine. Music is by Hesham Abdul Wahab who has done a decent job with his songs.Bijipal's background score gave the movie more life.